In part 1 of this post, I outlined why the prices of gold and silver have come off their highs and have been in a holding pattern for the past 16 months even as the fundamental reasons for owning gold have improved substantially. In this post, I hope to explain why gold and silver could shoot up at any moment like a beach ball that has been held under water as the water level rose around it. As I discuss in a recent post titled “Understanding Gold Pricing” the price of gold, like everything else, is determined by supply and demand. Below are some emerging and/or poorly understood supply and demand fundamentals that will push gold higher. 1. 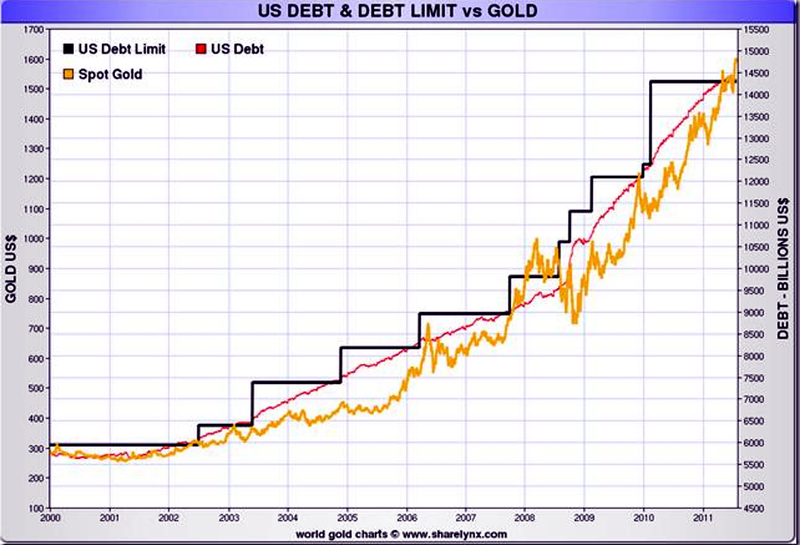 QE4infinity and the new debt ceiling debate will light a fire under gold starting NOW. The chart below is all you really need to know about gold pricing. Everything else in this article is just icing on the cake. When we discuss demand for gold, we are talking about the number of dollars chasing gold. It stands to reason that if the number of dollars increases, more of those dollars will chase gold. There are several different measures of the money supply depending on what types of currency and debt instruments you include in the measure, but historically gold has had a strong correlation with base money as represented by the balance sheet at the Federal Reserve. The chart above overlays the gold price and the Fed balance sheet. (The bottom axis seems to be skewed by a year but we’ll let them slide.) In the 1990s, gold was a forgotten asset class having bubbled and popped in the early ’80s. Beginning in 2000, gold began it’s steady climb to begin catching up with steady money printing in the ’80s, ’90s and ’00s. The financial crisis temporarily caused a major dip in the gold price, but as the Fed cranked up the printing presses to fight the financial crisis, gold began to rocket higher. As we begin 2013, the fed has just announced QE4infinity, promising to print $85B per month (or $1T per year) until the economy improves. This is illustrated by the red dotted line and we are right at the beginning of that line. Look again at the chart. Notice how the gold price responded to a modest $2 trillion increase in the balance sheet in four years. Now project ahead to guess how gold might respond to the red dotted line. If you’re not sold on the correlation between the Fed’s balance sheet and the gold price, perhaps you’d prefer the correlation with US debt as shown by the chart below. The last debt ceiling debate we had in Summer of 2011 saw gold run up from $1500 to $1900 in two months. Of course, if you think the US will begin paying down its debt any time soon you may not be that bullish on gold. 2. New big buyers appear poised to enter the market. 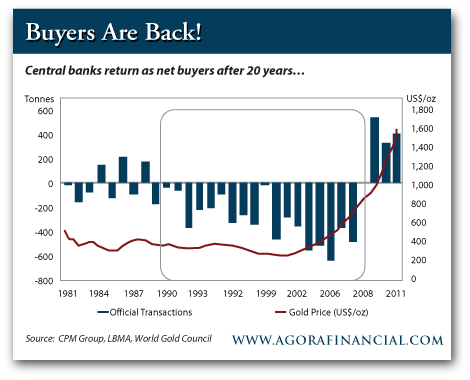 Central Banks- For years, central banks of the world were net sellers of gold. Then in 2009 they became net buyers for the first time in 20 years. The World Gold Council estimates the central bank net purchases will top 500 tons in 2012. While this trend has been going on for a few years, it seems to be accelerating as central banks around the world, primarily in emerging markets scramble to increase their holdings. The People’s Bank of China in particular will continue to be a large buyer. With over $3 trillion in foreign reserves they are estimated to hold between 2%-5% in gold with a stated goal of getting to at least 10%. That’s a minimum of $150B of gold demand in the next few years. TOKYO—A small number of pension funds in Japan have started to invest in gold for the first time, largely to mitigate the damage from possible market shocks. Generalists- (aka fund managers who don’t specialize in gold.) It’s important to realize that despite talk of gold being in a bubble, the truth of the matter is that almost nobody owns gold. Sure there are a few gold bugs and the rare fund manager that allocates some of his portfolio to gold, but as the chart below shows, gold represents less than 1% of global financial assets. Keep in mind that slow rise in gold percent of assets over the past decade happened while the price of gold increased from below $300 to over $1600 so much of the allocation rise can be attributed to the price going up, not more people buying gold. With bond yields around the world at record lows, economic uncertainty, and global money printing on a never before seen scale, does it make sense that fund managers may start looking to diversify more than 1% of their assets into gold? If these “generalist” fund managers decided it’s prudent to up there gold allocation to just 2%, there’s simply not enough gold for them to buy at today’s prices. The only way that can occur is with a sharply rising gold price. The global banks are regulated by banking guidelines established by an international group called the Basil Committee on Banking Supervision. The third iteration of these guidelines, Basel III, is scheduled to be implemented in stages from 2013-2019. While the details seem to be continually evolving, the new regulations will require banks to gradually increase their capital reserve and liquidity reserve requirements. Basel III also reclassifies gold as a Tier 1 asset which means banks can count 100% of the value of their gold holdings as capital whereas in the past, they could only count about 50% of the value of their gold holdings. For a good summary of how Basel III may impact gold, check out this article. In short, this puts gold on the same footing as cash and U.S. Treasuries when it comes to the leverage ratios they can have. Banks now have a choice if they want to diversify out of some of their Treasury assets yielding a small percent, into gold which has yielded 16% per year compounding interest for the past decade. At the very least, this is a gentle tail wind for gold moving forward, and potentially a big price driver if more banks decide to hold gold as an asset. These “new” buyers identified above are in addition to the steady demand from India and the rapidly increasing demand from a billion Chinese citizens who are gaining wealth and at the same time, being provided with more and more ways to purchase gold. In addition to new mines struggling to keep up with depleting mines, the cost of mining gold is rising. Rising energy and labor costs coupled with lower and harder to reach ore grades have caused a steady rise in production costs in the past few years and a big spike in 2012. Industry insiders estimate the per ounce production cost for 2012 to be around $1000-$1200, up from $662/oz in 2011. 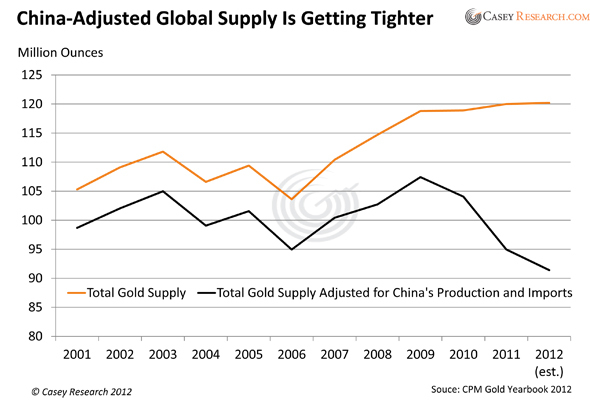 But as the article points out, the Chinese are not just content to buy up gold already on the market. Since 2011, Chinese companies have been on a shopping spree, buying up gold mines around the world to ensure they meet their gold needs in the future. New mine supply, and recycling is only part of the supply picture. Since virtually all of the gold that has ever been mined still exists in above ground stocks, the flow of new gold is only a small fraction of the stocks of gold held by central banks, private investors, and increasingly ETFs and other gold funds. But those stocks of above ground supply are not all created equal. Bullion bars held in a private vault or a gold bug’s basement need a lot of coaxing to make them available for sale. On the other end of the spectrum, gold in Western banks can be loaned into the market and rehypothicated, and gold in futures exchanges can be levered up many times adding to supply. But as Western economies become more indebted and markets less trustworthy, more people are demanding physical gold. Hugo Chavez made news when he repatriated $11B of Venezuelan gold from Western central bank vaults. Since then, other governments and citizen groups from Ecuador, Netherlands, Switzerland, Germany and others have taken notice and are realizing that storing all of their gold in an account at the Fed or BoE might not be the best idea and have taken steps to repatriate (or at least audit) their gold. The embargo on Iran may or may not have an impact on Iran’s nuclear ambitions, but it has had an impact on their gold trade. Since Iran has been shut out of the banking system for international trade, they have been forced to trade with barter agreements and gold. As I discussed in an article called “What if OPEC Nations Demanded Gold for Oil” any shift away from the petrodollar towards a gold trade would have devastating effects on the dollar and drive gold prices higher. Leverage is a double edge sword. As gold moves out of the banking system the amount of gold that can be levered up shrinks which can have a big impact on supply. Ok, I feel like I’ve rambled on enough. Hopefully, I’ve addressed some new reasons (or at least reasons I haven’t discussed before) for buying gold (and, of course, silver). If your salary, savings, stocks and bonds are all dependent on the U.S. economy and U.S. dollar I hope you will at least take some time to consider that fact. And take action to rectify it. This entry was posted in Investing and tagged dollar, gold, silver. Bookmark the permalink.